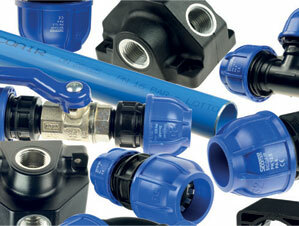 Offering larger sizes up to 50mm, Tom Parker is expanding its range of SICO-AIR ringmain systems. Italian manufacturer, SICOMAT, recently chose Tom Parker to be the main distributor of SICO-AIR ringmain systems in the UK and expansion of the offering represents a natural progression for the company. Unlike traditional malleable iron technology, which is heavy to install and requires screw fittings, SICO- AIR uses lightweight extruded and calibrated aluminium pipe up to 6m in length and nylon compression fittings which are simply attached to the pipe without the need for threading or welding. The systems are quick and easy to install while the smooth bore aluminium pipes provide an excellent flow rate and reduced pressure drop as well as resistance to fire, UV exposure, shock and long-term corrosion.